Sharp's first smartphone and tablet with IGZO displays are on the way, months after they were first rumored. 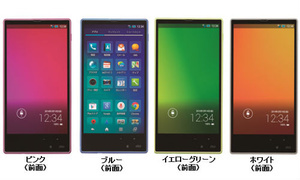 The Aquos Pad tablet and Aquos Phone Serie mini smartphone will both feature the technology and will be released in Japan through carrier KDDI. Both feature high-end specs, with the Aquos Pad including a 7.0 inch 1080p IGZO display, a 2.3GHz Snapdragon 800 processor, 2GB RAM, 16GB internal storage with a microSD slot, a 4080 mAh battery and dual 13.1MP/2.1MP cameras. The camera, besides having a large sensor, also has an f/1.9 aperture, "BrightEye" technology for image processing and 0.4 second booting time. On the smartphone side, the device has a 4.5-inch 1080p IGZO display, a 2.2GHz Snapdragon 800 processor, 2GB RAM, 16GB internal storage, a 2120 mAh battery the same cameras and features. Both devices are also waterproof, says the carrier.